Of Lane’s four known depictions of the New York Yacht Club Regatta at New Bedford (August 8, 1856), this view appears to be second in sequence. The four paintings include this work, New York Yacht Club Regatta (1), 1856 (inv. 66), New York Yacht Club Regatta (3), After 1856 (inv. 396), and New York Yacht Club Regatta (4), 1857 (inv. 397).The starting gun at 10:50 am signaled all participants (anchored at the starting line) to raise sail, the third class (smallest vessels) to start first. At 10:55 am, the second gun signaled the second class to proceed, as is depicted in this painting. Some of the first (largest) class are still raising sail, while the large sloop in the foreground is jogging, waiting for the third gun at 11:00 a.m. In this painting, Lane was off the Fairhaven shore, looking west toward New Bedford on the far shore, the heart of the city to the far right. The rural peninsula stretching south to Clark’s Point is largely hidden. The committee boat (schooner “Emblem”) is anchored near the beacon (not visible) marking the west side of the harbor channel. The starting line extends from there, south-westerly, to Butler’s Flats. The yachts under way at far left are close-hauled, sailing south-south-east to the harbor entrance, then tack to the south-west until off Clark’s Point. From there it will be a long leg south-south-east, close-hauled, to Naushon Island and another long tack westward. 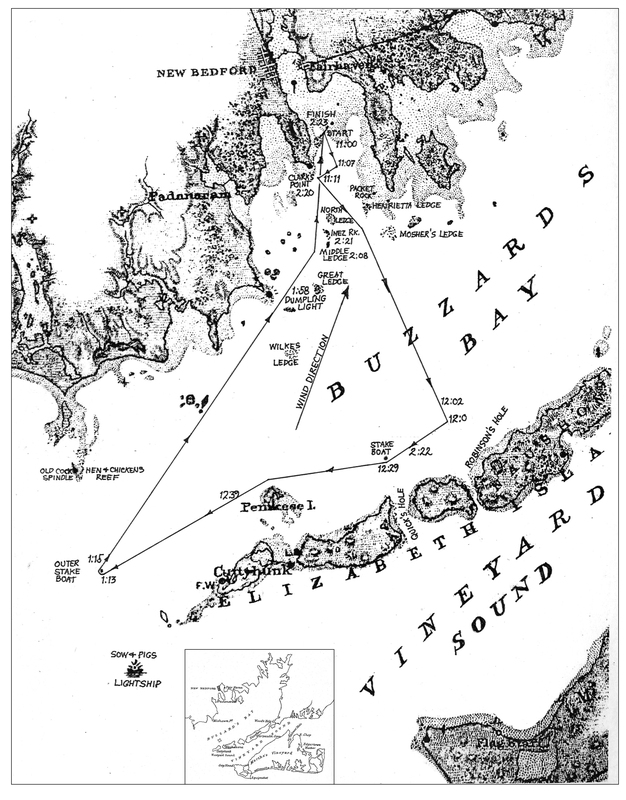 The strong breeze and choppy sea are very typical of summer sailing conditions in Buzzards Bay, and Lane has depicted them without exaggeration. So skillfully are they shown in this series of paintings that there should be few if any reservations about his ability to depict weather and seas in unfamiliar coastal locations. 1966 DeCordova Museum: DeCordova Museum, Lincoln, Massachusetts, Fitz Hugh Lane: The First Major Exhibition, no. 42. Muller 1976: Paintings and Drawings at the Shelburne Museum, no. 192. Citation: "New York Yacht Club Regatta (2), 1856 (inv. 270)." Fitz Henry Lane Online. Cape Ann Museum. http://fitzhenrylaneonline.org/catalog/entry.php?id=270 (accessed April 22, 2019).